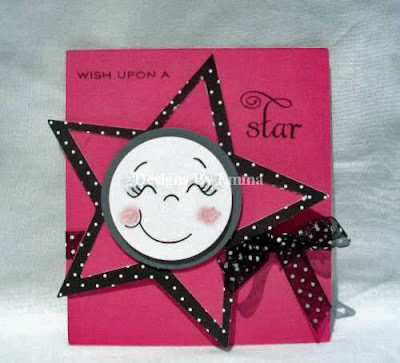 This week's challenge over at http://www.peachykeenstamps.com/index.html was to create a card that had a square, a circle & a star! I think I pretty much covered it all! I think my pretty little star looks so happy that she's ready to be a winner!! :) All cardstock, patterned paper & sentiment is from PTI. Ribbon is from Walmart & the adorable little face stamp is from Peachy Keen Stamps! I hope you enjoy today's card & please feel free to leave a comment! Thanks & have a great day!! Couldn't have said it better myself Kathy! You're absolutely right! Clean, stylish, very cleverly thought out and fun card! Thanks for playing along with us Emma! adorable star card! the little face is so cute and i love the colors! !